Just northeast of Seattle, the once-sleepy former logging town of Bothell is booming with industry and activity, with an expanded downtown core, incredible parks and playgrounds, pools, pubs and more. You can eat well, too: New foodie-worthy restaurants welcome families for dining adventures. And with parks starting to glow with fall color, it's the perfect season to play tourist in this leafy community. Here are our favorite hot spots. 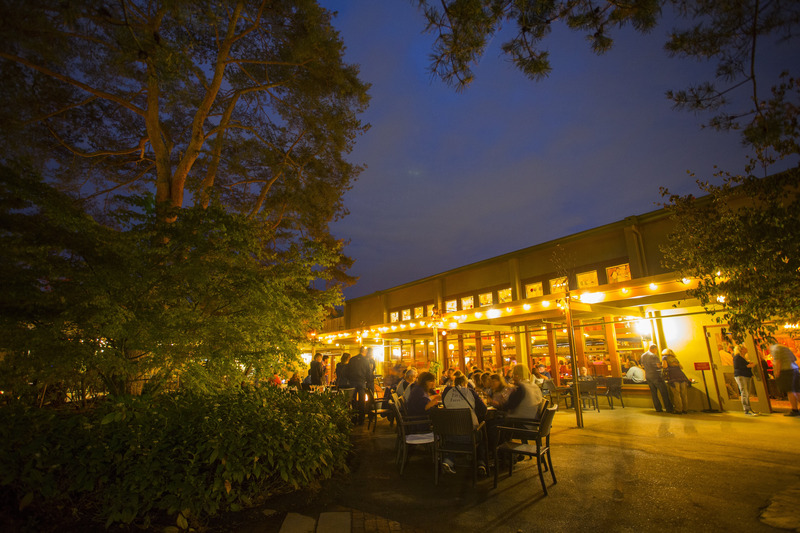 The opening of McMenamins Anderson School in downtown Bothell put this town on the map for many Puget Sound families, and for good reason: It's a megaplex of family fun. Want to make a splash? Visit their indoor “lagoon” which is a full-sized, extra-heated (88-90 degrees), saltwater swimming pool that's perfect for young kids. Have your ID handy, because Bothell residents swim for free. After a dip, refuel at Tavern on the Square, one of six restaurants/bars on the premises, which offers kid-friendly fare ("Three Bears Porridge”) as well as dishes created by Chef Mike Davis of Salish Lodge fame. And there's more: The old-world inspired movie theater lets you dine during the show, wth matinee tickets starting at only $7. The theater caters to the hearing and seeing-impaired as well; ask upon arrival for devices. Anderson School also hosts frequent music shows, and many of them are all-ages. Check the calendar. Bonus: Only a five minute walk from McMenamins, Bothell Public Library has story times that are purposely scheduled back-to-back for preschoolers and toddlers (Tuesdays, 10 a.m., 11 a.m.) and young toddler and infants (Wednesdays, 10 a.m., 11 a.m.) Stop by Social Grounds eco-cafe on the way for hot chocolate or coffee. Just a mile north of downtown, in The Village at Beardslee Crossing, Beardslee Public House is the only casual dining spot of restaurateur John Howie (of Seastar and John Howie Steak fame) and the perfect platform to educate your kids on how to be mini-foodies. Its elevated pub-food menu is stacked with dishes that are locally sourced and sustainable, such as hand-tossed pizzas, wagyu beef burgers and housemade brewing-grain pretzels. The large, open dining space — which absorbs noise — is ideal for parents who would normally shy away from dining out with littles. Bonus: On an especially beautiful fall day, sit on the outdoor patio strung with summery-lights. Order the dill pickle martini and the grilled kalbi meat candy app for an unexpected, superbly paired departure from usual pre-dinner picks. A relatively new park about four miles of downtown, Miner’s Corner County Park has won acclaim as the region's first universally accessible facility, 13 acres designed to maximize play and preservation. Features include low-impact development, the Northwest's tallest ramp-accessible lookout tower and a stormwater-fed sand and water garden that encourages hours of open-ended play and nature connection. Bonus: Bring sports equipment to play on the park’s green belts; or wander the walking trails to explore or pause for a picnic. There is also a large covered area with picnic tables for hosting fall birthday parties rain-free. Run by the Kaskes family since 1965, the Hillcrest Bakery is a European and Danish bakery that has been a sweet staple along Bothell's Main Street for generations. With daily-made baked goods, you’ll find traditional favorites like marzipan or eclairs, but also crowd-pleasers like maple bars and apple fritters. No matter what you order, it will be hand-folded, tossed, baked or sprinkled. Having fun at Bothell Landing with WhatsSup paddleboard rentals. Photo credit: City of Bothell and WhatsSup. Get outside: Paddle, peddle, explore! Where can you launch paddle boards, ride bikes along miles of riverside trails and bird watch all in one place? A short walk from downtown, located on the Sammamish River, The Park at Bothell Landing is a charming combination of outdoor park and extensive trail system (it's right on the Sammamish River trail). After monkeying around on the play structure, break out the bikes and ride beneath old-growth trees. Look for cranes, eagles or even hawks. In nice weather, rent paddleboards from WhatsSup rentals. Bonus: Another draw is the large amphitheater to the left of the play structure, tucked beneath the wooden bridge spanning the river. Its semicircle shape is anchored by a sunken stage where little thespians can put on a show. Bothell moms already know that Blyth Park is a hidden gem east of Main Street, tucked off of West Riverside Drive. 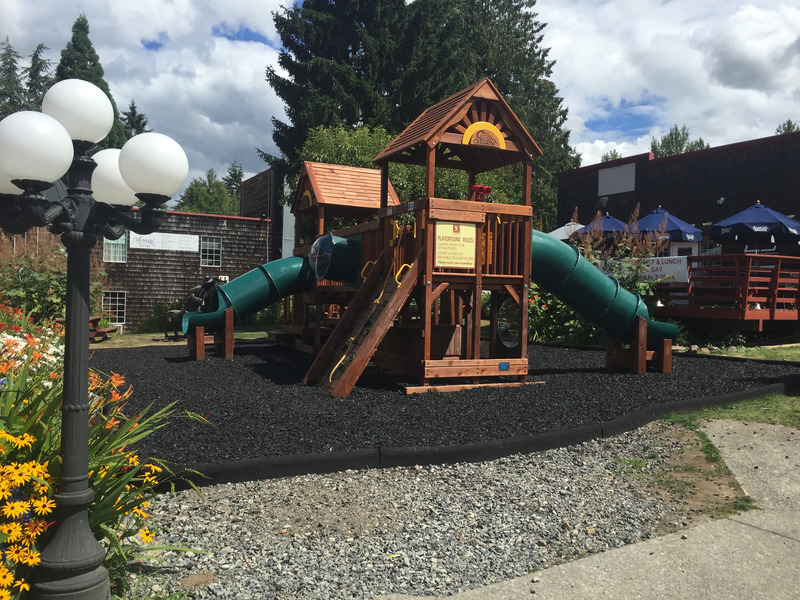 At 40 acres, it is Bothell’s largest park, and its newly revamped playground has multipled its appeal, with several play areas for different ages and an innovative design that has your kid’s balance and motor skill development in mind. The rickety wooden structure has transformed into a multiple twisty-slide, rock-climbing and suspension-bridge mecca. This is a great spot for moms to meet up and let the kids run wild. Bonus: There is also a full disc golf course and walkable dirt trails that connect throughout the entire park. This is also a great place to stage a scavenger hunt for your kiddos to identify native plants. Getting there: Bothell is the geographical bolt that connects the Eastside to the north end. It’s 12 miles north of Bellevue and only five miles north of Kirkland’s waterfront. Tucked along the Sammamish River trail, it is west of Woodinville’s wine country and even easier to access thanks to the new Exit 23 ramp off 405-N.
Megan Munroe is a mother of three, freelance writer and photographer. She's also the story director for Reach, an Eastside nonprofit that collaborates with local filmmakers, photographers and writers to share encouraging stories of her community. Megan lives in Bothell with her husband and loves to garden. She has high hopes of someday turning her gray thumb into a green one. To read more visit her website.